I am slow to getting around to the books I have on my Kindle, and since my husband started wondering who was stealing from the bank account, ahem, I had to stop my downloads for a bit. But never fear. I have plenty of books to review. Spell that slowly, because I… have… plenty. You all know I read both Christian and non-Christian books and review them. I have more favorite authors these days than I did a long time ago when my nose was constantly stuck in textbooks. So, I finished Irene Hannon’s “Vanished” (written 2013, this is how far I am behind) late last night. Well-developed characters, even the bad guy. A fantastic suspense with a sweet romance. Irene Hannon writes Christian fiction and this book is readable by all since it is not preachy. I swear, Dale Amidei is/was an assassin. Perhaps, married to one. Ahem. His knowledge and research are frighteningly real, vast, and varied. Dale, does the CIA know about you? Are you like, a consultant to the intelligence community? Okay, besides that… I just read ‘A Garden in Russia,’ his fifth in the Boone File series. Dale is adept at writing strong female characters, tough guys, nurturing men and women, and villains in the end, who have far more to do with what is the lethality of politics and intrigue than a shadowy character with a knife and evil intent. I’ve read all of the Boone Files, and this does not disappoint. After #4, while I awaited #5, I started at the beginning, ‘The Anvil of the Craftsman,’ which I pressed here previously. A writer, reader of well, any genre can see the ability of Dale Amidei’s writing as complex, intriguing and well-crafted. I honestly hold my breath often, wondering who is going to be shot? What will happen here? The powers and money behind what happens in the U.S. affects what happens in Russia as well. Like I said, more real than not. Read the paper, watch the news, then you tell me, how did he nail those details so well? Dale’s writing? Never a disappointment. Okay, so that’s my bathroom. Romantic comedy, right? Rebecca: Firstly, thank you, Dale, for allowing us to guest post on your page. 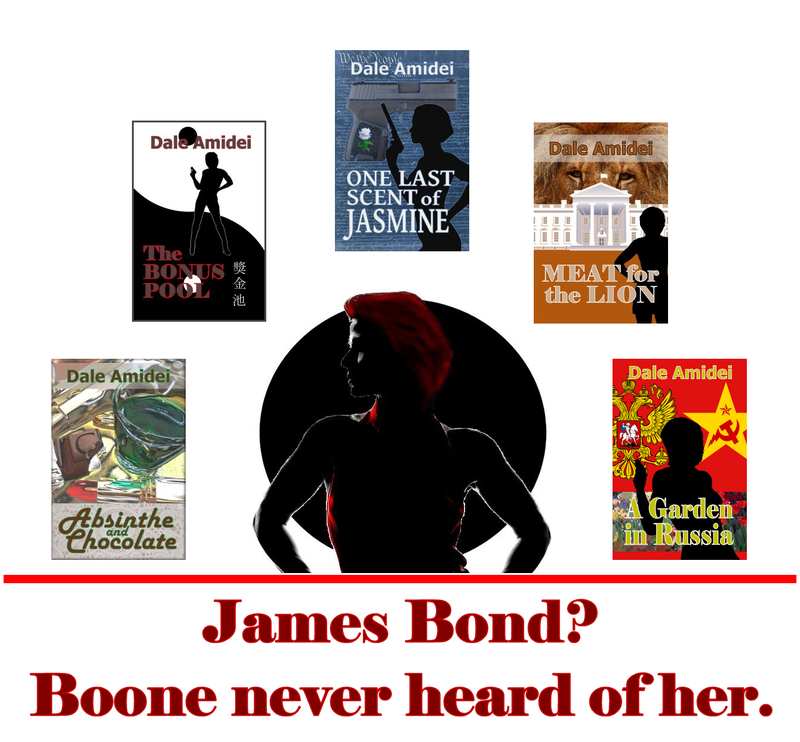 Claire O’Sullivan and I are here to nag Dale Amidei about his newest book discuss Dale Amidei’s first female heroine in his Boone series of espionage thrillers, a sort of international/ political Tales from the Dark Side. Dale writes complex, powerful novels that pull his characters into unthinkable situations, which is why I have temporarily given up paranormal fiction in favor of devouring his books. Claire: Readers and writers alike, no matter their preferred genre, would find Dale’s geopolitical intrigue novels exemplary. Rebecca: That’s some mighty highfalutin language there, but I think you’re absolutely right. Claire: All I’m saying is that, as primarily a romance reader, I find his books a delicious departure from my usual reads, just like you do. Rebecca: Can’t argue with you there … but about Boone: How do you relate to her character? Claire: I think she’s a bad-arse, and I mean that in the “holy-crap-if-she-was-real” sense (and maybe she is). I wouldn’t want to get on her bad side. Respect her, yes. Mess with her, no way. I would actually like to be Boone. What about you? How do you see her? Rebecca: Well, you know, every woman has those days when everything jells, right? The makeup and hair work, the clothes fit perfectly, the job rolls on smooth wheels. Then there’s the rest of the time, when the mirror and the closet are your enemies, and the job develops a square wheel and just clunks along, and the kids track dog poop all through the house ten minutes before the party. Those kinds of issues are hiccups in the greater scheme of things, I know, but they seem like disasters at the time. Claire: I’ve read all four of Dale’s Boone’s File novels, and I’m waiting for the fifth one, A Garden in Russia. Taken together, they chronicle Boone’s journey from a flawed, confused enforcer of justice to a clear-headed confident woman who manages to reconcile her profession with her soul. She’s a cool, aloof bad-girl trigger mama in the first book, truly someone you’d not want to disrespect. But she changes as each novel unravels another of her protective layers, and she begins to thaw into something more human and fragile. Rebecca: Exactly! And I think the title of the first Boone book, Absinthe and Chocolate, describes her perfectly. Chocolate represents everything Boone is: rich, lush, exquisite, and extreme. Absinthe, nicknamed the “Green Fairy,” symbolized a changing social order in 19th-century Paris, a new generation of free thinkers and transformative ideas. The Green Fairy was also the embodiment of rebellion, especially female rebellion. Boone is nothing if not transformative and rebellious. Claire: Well, you’re just chock full of weird information. But why am I not surprised? Dale’s first book hooked me into the series. It really showed Boone’s skills as well as her flaws. But in the second book, The Bonus Pool, Boone learns from a persecuted Chinese Christian pastor how to find peace in her life, and that we all “go from darkness into the Light.” Dale is a master at crafting Boone’s reflections on the old man’s words, as she moves from her internal conflict toward peace. That starts the ball rolling for Boone. By the end of the third and fourth books (One Last Scent of Jasmine and Meat for the Lion), she’s moved away from her despair and doubt, and into a more clear-headed sense of her purpose in life. Rebecca: Seeing her transformation made me want to say, “Maybe I can do that, too. In my own way I can be better, if I remember that every move is always from the darkness toward the Light.” In these days of turmoil both here and abroad, that’s a good way to think, not only for Boone but for the rest of us who are still cleaning up the dog poop. Claire: But regarding the writing—you know, Dale writes so well that there are days I wonder why I even bother. And did you ever ask yourself, how does he know so much? Rebecca: After reading his novels with all those Special Ops and gun-related details, do you really want to ask that question? Claire: Well, maybe no. But I do enjoy his books, because they’re not just complex in terms of characters and storylines. They address the human condition, whether it’s Boone or another character discoursing on current global and political issues. And in Boone’s case, he manages to hold up a mirror to her soul, so that she—and we—can see her heart laid bare. I feel like I know her better now. Rebecca: Well enough to mess with her? Claire: You think you’re so funny. ..
Rebecca Johnson was born and raised in the southern United States, mostly in North Carolina with brief relocations to South Carolina and Virginia. She is by education a medical technologist, graduating with honors from N.C. State and UNC-Chapel Hill, and by preference a calligrapher, needlework designer, and graphic artist. She writes paranormal romances by night when no one is watching, and hides her manuscripts under quilting and needlepoint projects during the day. In her spare time she beta-reads for other writers, searching for nitpicking errors. She believes that God’s purpose for her life is to cause as much trouble for as many people as she possibly can, and she spends at least part of each day fulfilling that purpose. Claire O’Sullivan was raised in corn and cow country in the Midwest where she learned the nuances of ‘moo’ to PhD level (piled higher and deeper). She attended the University of Wisconsin at River Falls (aka Moo U) with a major in psychology, and changed minors every other week. She left Moo U and attended Lutheran Bible Institute and obtained her Bachelor’s degree in Biblical studies. She has fiddled with writing forever, and currently has several crime/romances in the works, including a comedy noir. She’s pretty sure that Rebecca is indeed fulfilling her purpose by tormenting her daily… er, helping Claire endeavor to write. Thank you, ladies. I couldn’t have said it better myself. and other places where ebooks come alive. I read this blog and clearly, will be reading this soon. The genre is ‘up my alley,’ and reading the interview has sent me to Amazon, on my wish list! I love sharing my process. It’s kinda fun. The how-to’s of what I do to plot/pants/polish a manuscript (rewrite…). Takes me forever. But, that is part of ‘my’ process. I’ve shared some of my ideas on process before, but, I am not an expert. Be careful. Why? Experts are frequently authors. They’ve done well. Experts are all over the place. I Googled the findings of experts and writers of experts were available. Over … three … million. Yikes! You are now too paralyzed to write for fear of breaking the rules, regulations. Your process is decimated, the manuscript is cooked to death and your love for creative writing is gone. Gone, I tell you, gone. Might as well be a ‘Kill Bill’ extra where volunteers set themselves to die (for real). You’ve buried the manuscript. Taken up skydiving. Without the parachute. I mean, read fiction. The genre you love, the genre you don’t. Immerse yourself in books that are clean, spotless, and I don’t mean the edit. I am talking about voice. Your voice. I hate horror. But I love Stephen King’s writing. Flawless. Characters that make a novel scarier. Oh, please, do not watch movies based on the book. You will never get a real voice, inner thoughts, emotions as actions. Now the destruction begins. Have you killed your darlings? Fixed plot holes? Made characters three dimensional? You are ready for your critique group. They will find more. And you are allowed to weep. The important aspect is ‘listen to your critique group’. Sweep, dust, clean the mangled manuscript, and get your beta group. Whatever you do, do not use friends, family as readers. They don’t want to offend you. Allow the attacks. You’ll be stronger for the battle. Again, listen to your beta group. Everything is subjective, in the eyes of the groups that read your work and in the opinions of the experts. Are you satisfied? Did the changes help? I keep copies of what I have cut, one never knows when that scene will be pertinent to the next novel. A bit OCD I suppose, I keep every copy from a daily write in a file. Because the previous scenes/language/character might have been better than what you pen right now. Yeah, Sherlock. Keep it safe. So there you have it. Again, my process. Listen, or listen not. It has meaning for me, perhaps not for you. But for cryin’ out loud, do not … do not run to everyone who calls themselves an expert. Don’t drink the poison, and please, don’t sign this.